A few weeks back, the prompt for 52 Ancestors in 52 weeks was COLOR. Here’s my story, better late than never. There are no colorful names in my family or anyone that I really consider to be a colorful character, but there were (and still are) a lot of artistic people in my family. My mom, Gladys MARTIN HEISER (1921-1999) was one of them. I have many black & white photos of my mom taken during WW2 when she was a government girl in Washington, D. C. One in particular has her in a blue sweater; the sweater in the photo was obviously colored. Several relatives have copies of this photo, all colored with the same blue color. There are a few other colored photos, too. I often wondered who colored them. A 2013 conversation with my cousin, Rose Marie GANUS WARD (1941-2015), likely uncovered that mystery. I mentioned the blue sweater photo to Rose. She told me my mom used to color photographs. Rose had a black and white photo of herself, and mom colored a few of them for her, making the dress a different color in each one. Rose also said that Mom was really good at coloring photos. My mom also had some photos of herself from WW2 that looked to have been done by a professional photographer. I wonder now if she bartered photo coloring for a professional photo shoot. Recently another cousin sent me some photos from his recently deceased mother’s house. 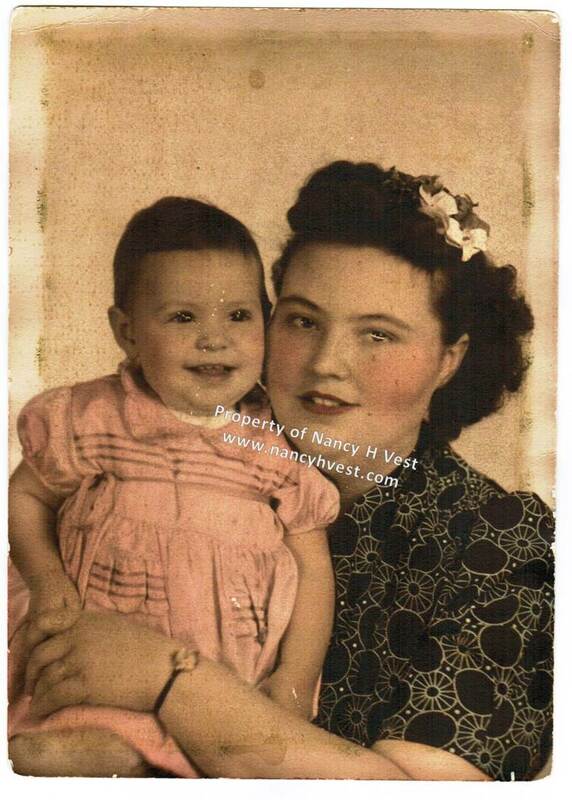 One of them is a colorized photo of Rose and her mother, Ruby MARTIN RUHLING (1919-1977), when Rose was a little girl. Ruby was my mom’s older sister. I wouldn’t be surprised if my mom colored that one, too. Now we have software to color our photographs, which I do, so everyone will know the color of my grandparents eyes and hair. I knew what color their hair and eyes were. I do love black and white photographs they have great definition, but as old photos age we must remember to put them on a Digital software or make a negative , print and darken them! Print them on good quality Kodac pape or fabic sheets made for printers, then spray with a fix that will protect the photos for years. Also, make sure the glass on your frames resist the damaging rays. Ask the frame expert at Michael’s or your local framing company for tips on how to protect your precious heirlooms. I’m no expert, but with my fabric art I print photos on fabric and use a fix type of spray they sell at Michaels – the ink I use to print is archival ink and then fix spray claims it will last for over 300 years or so… I won’t be here to see! ha ha! I also paint my ancestor’s in oils and acrylics 🙂 I was blessed with a bit of ability, but if you’re not try printing them on fabric sheets and adding a very light layer of acrylic paint! 🙂 What ever you do— protect and share your photos with your cousin’s 🙂 You can Google for information on this subject- also UTube videos can explain better than me. We need to remember to share our photos for future generations online, but perhaps put on the photo whom it is, circa taken, our name. 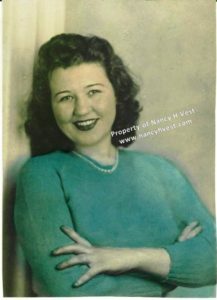 🙂 If we don’t share our photos’ of our ancestor’s may be the ones hanging in resale shops and in Cracker Barrel Restaurants – I’ve come across two of my ancestors online on GENI that our cousin found in a resale shop in Virginia! Oh my, how did that happen? Oh, no! How DID that happen? Glad they were discovered by your cousin. Good advice, Suzan. I need to be doing more with old photos, clearly.